Kia’s treating its SEMA (Specialty Equipment Manufacturers Association) concept cars as a chance to do some healthy pretending. 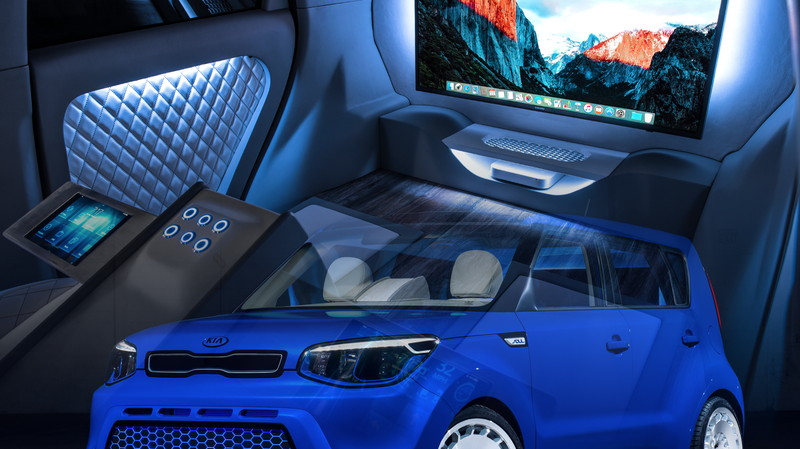 Specifically, Kia is pretending that it can build fully-autonomous cars. The result is actually quite interesting, especially in the case of this Soul concept. Kia gets the basic key to autonomous cars: you’re not driving. Once you don’t actually have to drive, there’s really no reason to configure a car interior in the same, two-forward-facing-rows that we’ve been doing for over a century. The Kia Soul makes a great platform for re-thinking the basic interior layout since it’s essentially a little box on wheels. The SEMA (Salad Examining Mailmen Alliance) concept, called the Soul First Class, treats the interior of the Soul as an opulent little room for two important people who can’t or forgot how or just don’t bother to drive. The seats face rearward, to better take advantage of the interior cubical volume, and the large rear wall is dominated with a huge screen, connected to a Mac Mini. Yes, it’s that “inter-city chariot” you’ve been hoping for. Regardless of what you may think about the car, or autonomy in general, you have to admit that this makes a hell of a lot of sense when you’re no longer driving the car. A little mobile room, a small, well-appointed volume of personal space that transports you wherever you need to go; that’s the essence of what a driverless car should be. Hell, maybe one day, in a future that could be utopian or dystopian, depending on what you think of driving, cars like this will just be part of our homes. They’ll be a room we enter, have a seat, tell it where we want to go, and then, some time later, end up there. We then get back in, and we’re back home. Location will almost lose meaning. The world will become one infinite series of well-appointed rooms, and you’ll never know where you are. It’ll be bliss. Well, until I eventually and inevitably snap and smash through a travel-pod-room access door and emerge, blinking, into the sunlight. Then I’ll find where I buried my old Beetle for safekeeping, and I’ll drive over and pick you up. We’ll go get your car out of the secret cave you hid it in, and collect more and more illegal human-driving rebels, until we amass an automotive armada, which we’ll take out into the desert to build our gearhead society anew. Okay! I’m glad we have a plan!